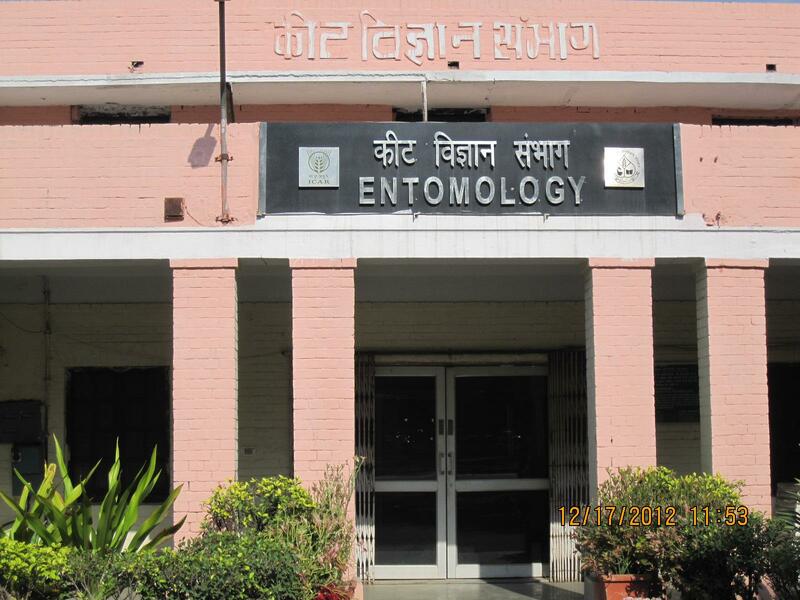 Division of Entomology is one of the first five Divisions of Indian Agricultural Research Institute established in 1905. The Division has pioneered in investigations in insect systematics and economic entomology vis-a-vis important crop pests. National Pusa Collections (NPC) with over five lakh specimen serves as a national repository for insect pests of crops. This Division has been the pioneer in basic and applied research frontiers in agricultural entomology to offer effective pest management solutions to the country in the past several decades with rich haul of expertise in insect biosystematics. The Division of Entomology established in 1905 as one of the five major Divisions of the then Imperial Agricultural Research Institute located at Pusa, Bihar was shifted to its present premises in 1936. Eminent entomologists like H.M. Lefroy, T. B. Fletcher, H.S. Pruthi, S. Pradhan and K.N. Mehrotra laid strong foundation for basic and applied research in Insect Science. Since insect pests were the major constraints in crop production, early investigations focused on insect systematics, biology and bionomics. Their pioneering contributions resulted in the publication of a monumental reference work viz., Indian Insect Life in 1906 by Lefroy and Fletcher and Text Book of Agricultural Entomology by Pruthi. Faunistic surveys led to the establishment of the National Pusa Collection (NPC), one of the largest collections of its kind in this world. Now this collection houses more than half a million specimens of which 0.1 million are authentically identified, comprising about 20,000 species. Over the last 50 years, 1500 new species of insects have been described from NPC. As a national service for pest diagnostics, every year, over 4000 specimens are identified by the taxonomists of this Division. Several taxonomic treatises on agriculturally important insects belonging to orders Lepidoptera, Coleoptera, Hemiptera, Orthoptera and Hymenoptera and class Acarina have been made from this Division. Currently, CD-ROM based diagnostics are being developed for various crop pests. In the early sixties and seventies, studies on economic entomology and insecticide toxicology were carried out by S. Pradhan that led to more of basic research in understanding mode of action of insecticides and fate of insecticides in the environment. Pradhan’s contribution to identification of the insecticidal principles of neem, the concept of Integrated Pest Management (IPM), periodicity of locusts, mode of action of DDT and development of ‘Pusa Bin’ stand out prominently in the annals of entomological research of our country. The biology and bionomics of major insect pests laid the foundation for adoption of eco-friendly IPM approaches. Significant contributions were made to understand the biology and host plant resistance of major insect pests viz., sorghum stem borer, sorghum shoot fly, American bollworm, pink bollworm, mustard aphid, cotton whitefly and white grubs. E.S. Narayanan and B.R. Subba Rao established a strong unit of biological control. Apanteles flavipes was even exported to Barbados for the control of sugarcane borer, Diatrea saccharalis in the seventies. Presently more than two-dozen parasitoids, predators and microbial pathogen species are reared for investigations. Predators viz., Crypolaemus montrouzieri and Scymnus coccivora were introduced in Caribbean countries for the control of mealy bug in 1996. A major attempt is being made to develop temperature insensitive strains of Trichogramma for our climatic conditions. Studies on tritrophic interactions to enhance parasitoid activity are one of the current thrusts of this Division. Besides elucidating the mode of action of azadirachtin, the antifeedant principle of neem seeds, a number of indigenous floras have been investigated for identification of insect growth regulatory properties (IGR). Insect toxicology studies brought out relative toxicity of insecticides against major crop pests and development of their formulation technology. Besides, studies were also carried out on persistence of toxicity, residue limits, safer waiting periods etc. This Division was the first to report insecticide resistance (IR) in Singhara beetle, Galerucella birmanica and has played important role in monitoring IR management in Helicoverpa armigera. Insecticide resistance has extensively been studied in major crop pests and management strategies have as well been developed. Biochemical basis of insecticide resistance was extensively investigated. Carboxyl esterases were found to impart an ability to degrade pyrethroids in the resistant strains of H. armigera. Selectivity of insecticide toxicity was attributed to the presence of many Acetyl cholinesterases and their differential inhibition. Studies on baseline susceptibility of the diamondback moth and the American bollworm to Bacillus thuringiensis have led to the understanding of genetics of Bt resistance in crop pests. The discovery of a nucleopolyhedrovirus (NPV) of tobacco caterpillar by N. Ramakrishnan in 1969 led to intensive research on insect pathogenic viruses, bacteria and fungi. Pioneering efforts by Ramakrishnan on genomic mapping of baculoviruses of insect pests during 1980s laid strong foundation for insect molecular biological research in the Division. Genetic engineering of baculoviruses through deletion of EGT gene, characterization of 20 hydroxy ecdyzones of insect pests, baseline studies on Bt resistance, molecular basis of xenobiotic resistance in crop pests, elucidation of Bt resistance genes in bollworm pests and barcoding of insects are some of the significant contributions made by this Division in recent times.. Recently, this Division has established a National facility for insect rearing for developing stand alone technologies for rearing insect pests for analytical studies and for developing novel artificial diets for several crop pests. To provide services in insect science and technologies.